Unless they are in purely anaglyph format the stereoscopic still image pairs embedded on this page are formatted for cross-eye free-viewing. First class meeting. Examine a range of equipment available for student use in creating stereoscopic work at CalArts. Conduct a brief discussion and demonstration of binocular parallax and visual perception. Comments on the primary differences in fixed POV stereoscopic displays and the interactive parallax of the variable POV of HMD’s etc. A brief discussion of depth scripting. A look at the course website from last year. Download and install Masuji Suto’s Stereoid Pro for Android and i3DStereoid for iOS on student smartphones or tablets. Hands on workshop demonstrating the principles of stereoscopic photography with a single lens camera via the horizontal-shift/sequential-shot technique known as the “Cha-Cha” method. Demonstration of how to view 3D playback from the computer workstation connected via the HDMI connection to the Vizio 47″ passive 3D monitor mounted on the lab wall. Screening of Part I, Part2, Part 3, and Part 4 of Brian May’s, A Brief History of 3D. Second class meeting. Continue working with Masuji Suto’s 3D photo software for smart phone and tablet . View a YouTube 3D slide show of 2012’s end of semester Course Exhibition in the B&W studio gallery A404, followed by Tole Mour VOTF 12: Blue Whales Across the Bow, and Tole Mour VOTF 12: Endless Sea Lions, as examples of Stereoscopic GoPro video shot using the GoPro 3D rig available from the School of Film/Video equipment cage. Learn the operation of the GoPro 3D rig through hands on demonstrations and tests. Discuss ideas for weekly topics based upon previous years notes. and current student’s interests. Third class meeting. Introduction to shooting stereoscopic stop motion with Dragonframe and the Mark Roberts S3 Stereoscopic Stepper. The S3 is similar to the experimental prototype rigs used to shoot Henry Selick’s Coraline in 3D (shown mounted on a multi-axis moco rig in the image below). Students take turns shooting tests with the S3 while alternatively shooting a range of interaxial distance test exercises of the with Steriod Pro or iStereoid software for smart phones and tablets. Fourth class meeting. Partial presentation of the PDF version of Aspects of Monocular and Binocular Depth Cues with an emphasis on the important role that Motion Parallax plays in depth perception (Adobe Acrobat and Adobe Reader were not installed on the new lab workstations during the summer upgrade which disrupted motion media playback –this issue should be remedied soon). A further presentation on the motion parallax basis for Viewpoint Dependent Imaging systems starting with Walt Disney’s demonstration of its simulation with the Multiplane Camera and then covering Ivan Sutherland’s development of the first interactive computer graphics Head Mounted Display with his Sword of Damocles and beyond. Students took turns directly experiencing interactive viewpoint dependent imaging by donning the Oculus Rift DK1 and exploring developer demos while others continued explorations of interaxial settings with the MRMC S3 and Dragonframe. Fifth class meeting. A very brief introduction to the artistic career of Ken Jacobs followed by a viewing and discussion of his works, Capitalism: Slavery , and Capitalism: Child Labor, In these works Jacobs alternates the presentation of the left and right images from stereopticon cards. The two images are registered one over the other and made to alternate in rapid sequence. We discussed the method Jacob’s employs to direct the viewers gaze upon particular aspects and individuals in the scenes by slowly shifting the horizontal positioning of the images so that homologous points align at zero parallax thus minimizing flicker induced motion at those points. We also discussed how the use of black frames between the flashed image frames differs from simply alternating flashing the images (and of how this stems from his live performance work with a large rotary shutter (which he calls the “propeller” due to its physical and symbolic qualities). We then moved on to the creation of another form of alternating stereo pairs known as wiggle stereoscopy via the New York Public Library’s interactive online site, Stereogranimator. The NYPL site, inspired by the research of Joshua Heineman, allows users to create wiggle stereo from a vast collection of 19th century stereo-cards. After a bit of hands-on experience creating wigglegrams via that site we looked at the ways that gray scale images may be used to displace a field of random dots in the technique developed in 1959 by the visual neuroscientist and experimental psychologist Béla Julesz. In addition to the work exploring the creation of Random Dot Stereograms, we also viewed and discussed the creation of autostereograms in the form of Single Image Random Dot Stereograms (SIRDS) through a process created in 1979 by Julesz’s former student and co-researcher, Christopher Tyler. The shareware program Sirds was used to demonstrate the creation of SIRDS images. Free viewing stereoscopic pairs via the cross-eye free viewing technique was demonstrated by vocaloid characters Hatsune Miku (with Red rather than Cyan hair in an oblique reference to anaglyph 3D), and Kagamine Rin in a very kawaii instructional video by Terry Hor. Seventh class meeting. A look at Brian Gardner’s graphs on depth scripting from his article, Perception and The Art of 3D Storytelling. This was followed by a detailed presentation on Brian’s discovery of dynamic floating windows as a creative solution to stereo window violations and as an important tool to further expand the art of cinematic story telling (described in this white paper authored by Brian and presented by his colleague Bernard Mendiburu at the Stereoscopic Displays and Applications XXII Conference). 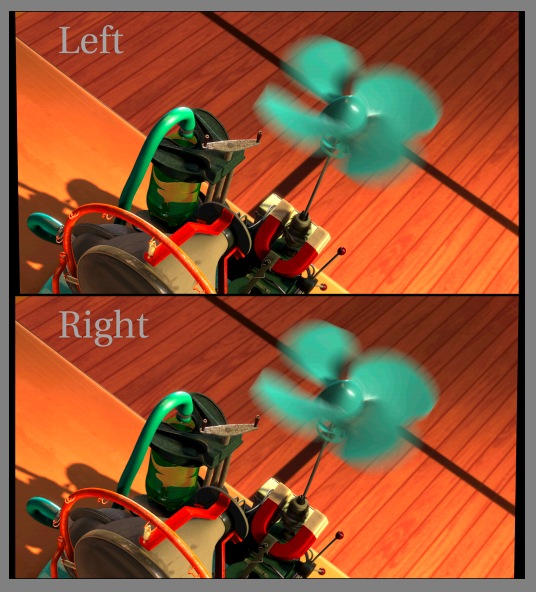 Brian developed his insights on the dynamic floating window while in production on Disney’s Meet the Robinsons. We also took a look at a case study paper authored by Brian’s former colleague at Disney, Robert Neuman. Disney’s distribution division, Walt Disney Studios Motion Pictures, produced a training video to insure that theater projectionists would protect the integrity of the floating window and not inadvertently mask it off. Viewing of clips from several stereoscopic feature films, including Meet the Robinsons, Coraline, Life of Pi, and Pina. Eighth class meeting. A presentation on the nature of chromostereoscopy and the development of the Chromadepth process. Viewing and discussion of two video interviews with artist, actor, and writer, Leigh McCloskey provided some insights into his expanded chromostereoscopic painting, The Hieroglyph of the Human Soul. The viewing of a vintage 30 second Crayola 3D Sidewalk Chalk commercial spot, Welcome to My World, was followed by a visit to the G-Lab Courtyard to experiment with drawing on the pavement with pieces from a Crayola 3D Sidewalk Chalk kit while wearing Chromadepth glasses. 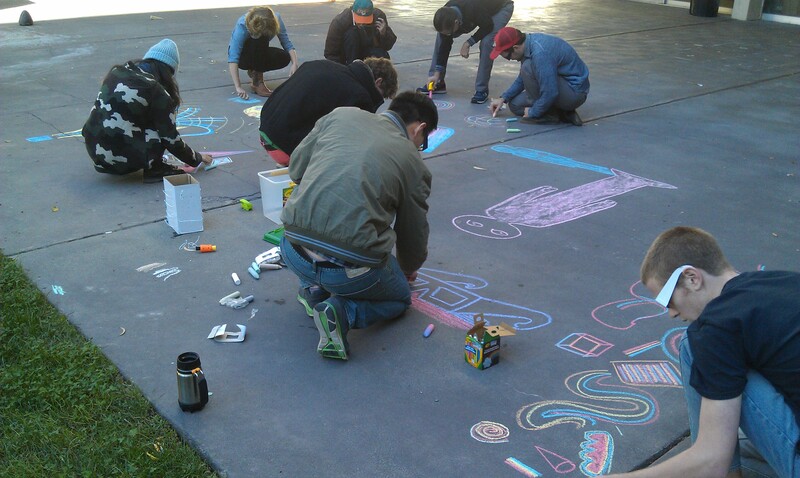 Click this line to access more photos of the 3D Chalk Happening in the G-Lab Courtyard. Ninth class meeting. View NASA anaglyph stereoscopic videos 3-D Tour of the International Space Station and Space Station Astronauts Grow a Water Bubble in Space. View documentation on the phantogram process. Set up the Fujifilm W3 stereoscopic camera in order to shoot phantograms for processing in Masuji Suto’s StereoPhoto Maker (SPM) software application. Open Parallels Desktop and Windows 7 on the four workstations it which it was currently installed so that some students could gain direct experience with SPM. Demonstrate some aspects of working with SPM including horizontal image translation and an on the fly investigation of the new Phantogram functions available in the latest release..
Tenth class meeting. A continuation of last weeks work with Masuji Suto’s StereoPhoto Maker in the creation of Phantograms followed by a look at other aspects of 3D image editing with SPM. This will be followed by a brief presentation on the inventive S3D shadow projection work of Laurens Hammond (Hammond filed a patent on his Shadowgraph process in 1923), R. L. Gregory, and Ken Jacobs. After the class break we will adjourn to the Video Studio (C115) in order to explore directly working with both anaglyph (and possibly polarized) stereoscopic shadow play. Ray Zone visited CalArts in 2011 to present a talk on the history of Laurens Hammond’s Shadowgraph work. After his presentation he joined us in the B&W Studio to participate in visiting artist Amy Halpern‘s demonstration of anaglyph 3D shadow play based on her work with Ken Jacobs as a member of the Apparition Theater of New York. Amy engaged students in a recreation of Ken Jacobs’ performance of La Mer which involved 3D shadows of a billowing polyethylene sheet and ended with a recording of Jacobs flatly stating the title “La Mer, La Mer“. At the time of this writing YouTube 3D viewing options are still broken in the Chrome browser so you will need to use Firefox or Safari to be able to change the options to cross-eye for free viewing or side-by-side for 3D TV viewing of the 3D slide show movie below. Viewing with the YouTube 3D red/cyan anaglyph option is an interesting and at times spatially ambiguous double anaglyph experience. Eleventh class meeting. A catch up day. General topics: TBD. Specific topics: issues and questions related to the creation and completion of work to be installed in the end of semester exhibition scheduled to open in the B&W Studio Gallery A404 on Thursday evening, December 4, 2014. Twelfth class meeting. Install end of semester exhibition in the B&W Studio Gallery A404 space. Thirteenth Class Meeting. Semester wrap up discussion and striking of end of semester exhibition.